What is the history of beach nourishment at Holden Beach? Small-scale beach scraping and dune repairs took place after Hurricane Hazel in 1954, but hurricanes in the 1990s warranted a more significant effort. The first major project, commonly referred to as the Federal 933 Project, was constructed in Spring 2002. Sponsored by the Army Corps of Engineers (USACE), 525,000 cubic yards (cy) of sand from the Wilmington Harbor Deepening Project was placed on the beach in the 100 – 500 blocks of Ocean Boulevard. Concurrently, the Town of Holden Beach placed 141,700 cy of sand to slightly extend the 933 Project. This was the only project to advance the shoreline, while activity since then has been geared toward maintaining the shoreline. In total, approximately 1.949 million cy of sand have been placed from 2002 – 2014 with the Town completing 825,900 cy of nourishment and the USACE completing 1.123 million cy. Sand for these projects came from various sources: Wilmington Harbor (525,000 cy), Oyster Harbor upland site (141,700 cy), Lockwood Folly Inlet crossing of Intracoastal Waterway (693,000 cy), Smith borrow site (559,200 cy), and the Boyd Street disposal area (30,000 cy). Why is beach nourishment needed? The primary cause of long-term erosion along Holden Beach is through natural processes of tidal currents, sediment storage in the surrounding inlets, storms, and rise in sea level. 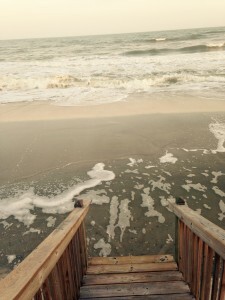 The Town of Holden Beach has been proactive in monitoring and maintaining their shoreline since 2001, and recent projects have allowed the Town to keep pace with erosion in many areas. However, the process of placing additional sand must continue into the future to ensure storm protection and the recreational and tourism benefits of a wider sandy beach. Infrastructure and utilities could also be at risk with a significant tidal surge. What is necessary for completion of a nourishment project? Ongoing annual beach monitoring determines if an engineer designed project is required. There are links to recent monitoring reports below. Permits are required by over 20 different federal and state agencies, for example, the Coastal Area Management Act (CAMA), the NC Division of Water Quality, and the US Army Corps of Engineers (USACE) to name a few. Permitting efforts require an environmental assessment or environmental impact statement depending on the source of sand and volume proposed, and take upwards of a year to be approved. Potential sand sources include upland borrow sites, intracoastal waterway and inlet dredging, and offshore sand. Compatibility and trucking are potential downsides to sand from upland borrow sites. Alternatively, the Lockwood Folly Inlet has proven to be a valuable source of beach compatible material due to routine maintenance dredging performed by the USACE for navigation. Sand received from this dredging is placed on the east end of Holden Beach. The Town recently piggy-backed the USACE dredging of the Lockwood Folly Inlet crossing which maximized sand placement and minimized costs by using one of the dredges already onsite for the Federal project. Borrow areas offshore represent another possible alternative because larger compatible volumes can be placed with less equipment on the beach. Offshore exploration of Holden Beach has revealed little to no feasible sand sources for renourishment, however further investigation has been recommended. Beach nourishments utilizing offshore sources require a significant up-front cost, although the volume of sand placed is greater and results in longer nourishment intervals. Offshore sand would most likely be transported via hopper dredges. Offshore sand has never been placed on Holden Beach before. Funding of costs for pre-project data collection, permitting, project construction, and post-project monitoring have been negatively impacted by federal and state budget cuts. The USACE projects typically require a 65/35 fund sharing agreement with the State, the County, and the Town covering the 35% local sponsor cost. However, federal funding has been limited and may never return. Depending on the USACE schedule and funding, an option exists for local sponsors to fund and construct their own federally-authorized project and later receive reimbursement for the 65% federal share. In the past, the Town’s Beach Preservation/Access and Recreation/Tourism (BPART) Fund has been instrumental in providing timely funding for beach nourishment projects, however the cost of the Central Reach project is too great to be funded solely from BPART funds. As of June 30, 2014, there is $5,547,190 in the BPART fund. Enthusiasm from residents and the Town is necessary to counter competing projects and interests. What beach nourishment projects are currently underway at Holden Beach? The Town has permits in hand for the Central Reach nourishment project that will allow for 1.31 million cubic yards of sand along 4.1 miles of shoreline between 240 Ocean Blvd. East and 781 Ocean Boulevard West. This project will utilize an offshore borrow area as its sand source, and is designed to last up to 10 years based on historical erosion rates. The project is slated to occur in the winter of 2016/17. Permits for the Central Reach project have expiration dates of 12-31-17. Funding for this project has not been identified. Click here for a tentative schedule and here for our Central Reach page. State regulations have only recently allowed the permitting and construction of terminal groins. The Town has begun the analysis and permitting required to construct a terminal groin on the east end. For more information see our Terminal Groin page. Due to lack of federal funding and an aging fleet of dredges, continued maintenance dredging by the USACE of the Lockwood Folly Inlet crossing is uncertain. The Town is working with the State to secure State funding and permit approval. The USACE Brunswick County Beaches 50-year project is ongoing, several years behind schedule, and over budget. Since its inception in 1997, the project has been delayed and a recent communication from the USACE was not favorable. In the opinion of the Town’s engineering firm, this project is too large and costly to receive funding. In addition to placement of sand, the Town has been proactively enhancing dune habitat on an annual basis. Wonderful stuff here! Really nice posts. Good effort! Awesome stuff here! Really interesting posts. Awesome effort! Fantastic information here! Very nice posts. Good effort! Wonderful stuff on this site! Really nice posts. Awesome job!